THIS November we’re celebrating William E. Barrett’s Birthday. 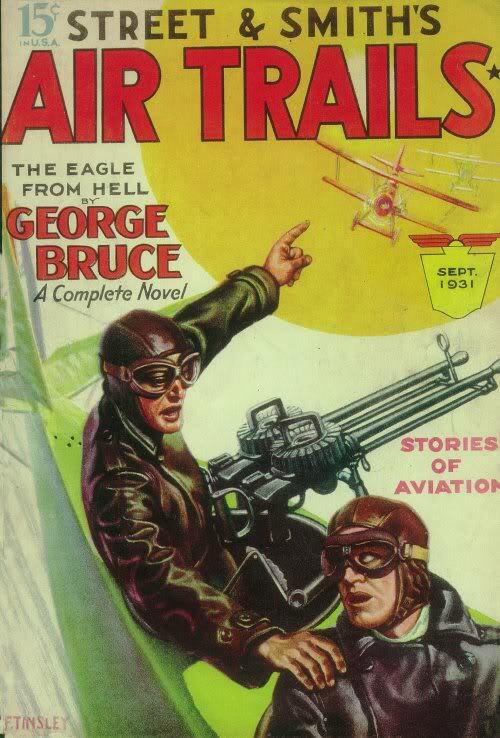 Before he became renown for such classics as The Left Hand of God and Lilies of The Field, Barrett honed his craft across the pages of the pulp magazines—and nowhere more so than in War Birds and it’s companion magazine War Aces where he contributed smashing novels and novelettes, True tales of the Aces of the Great War, encyclopedic articles on the great war planes as well as other factual features. Here at Age of Aces Books he’s best known for his nine Iron Ace stories which ran in Sky Birds in the mid ’30s! 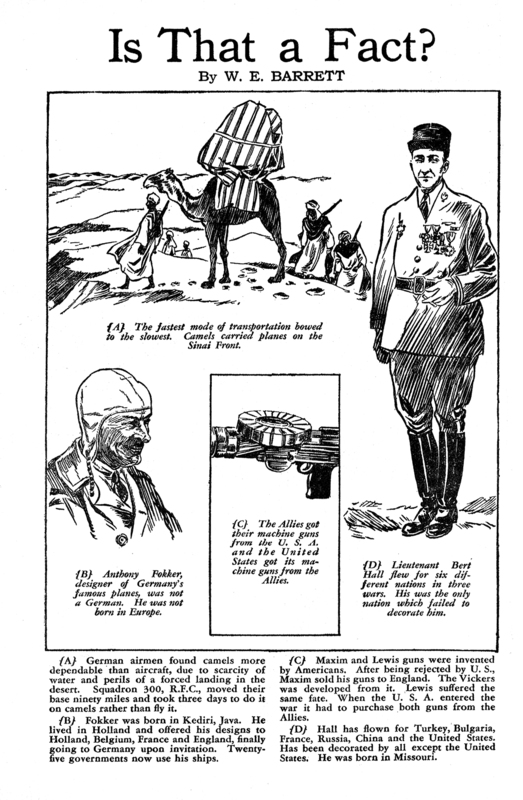 Among those factual features was “Is That a Fact?” which ran frequently in the pages of War Birds. It was an aviation themed version of a Ripley’s Believe It or Not kind of feature with hard to believe they’re true facts. Although started by Barrett, the feature was taken over by noted cartoonist Victor “Vic Vac” Vaccarezza in 1932. The September 1931 installment, from the pages of War Birds, features fun facts about Anthony Fokker, Bert Hall and the machine guns used in the great war! Next Monday Barrett features fun facts about Lt. Leo Ferrenbach, the Allied Cocarde, and a woman who married the German Ace who killed her first husband in combat! 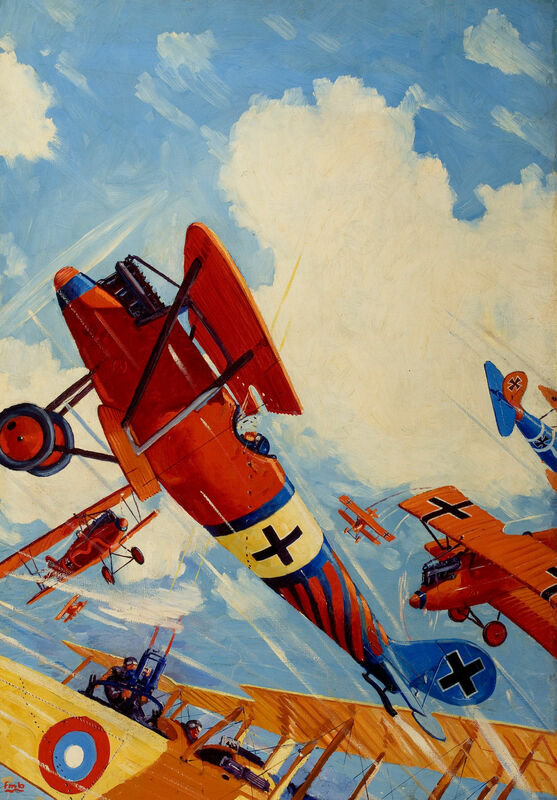 Editor’s Note: Every month the cover of BATTLE ACES depicts a scene from a real combat actually fought in the War and a real event in the life of a great ace. The series is being painted exclusively for this magazine by Frederick M. Blakeslee, well known artist and authority on aircraft and was started especially for all of you readers who wrote in asking for photographs of war planes. In this way not only do you get pictures of the ships—authentic to the last detail—but you see them in color. Also you can follow famous airmen on many of their most amazing adventures and feel the same thrills of battle they felt. Be sure to save these covers if you want your collection of this fine series to be complete. THE BEST way to tell the story of this month’s cover is in the words of the citation. The pilot was First Lieutenant Stirling C. Alexander of the 99th air squadron and the incident pictured happened in the region of Landres-et-St. Georges, on October 6th, 1918. Here it is. Read over the last four words of the citation, and remember—he had twelve Boches to fight! Not three or four, which would have been plenty, but twelve swift pursuit ships that could fly circles around the, comparatively speaking, lumbering reconnaissance ship. With those odds against him he completed his mission. A real pilot! It is hard to say who had the most important job, the combat pilot, or the reconnaissance pilot, but without any question the reconnaissance pilot had the hardest job. Where the combat pilot could pull out of a fight if anything went wrong, and, due to the speed of his ship, have a fair chance of getting away, the reconnaissance pilot in his slower ship had to rely on his observer’s aim. For him it was a case of fighting it out as best he could. If his observer was shot, or his guns jammed—well, it was just too bad. The reconnaissance pilot’s work consisted of observing troop movements, often deep in enemy territory; photographing, sometimes at low altitudes; special missions or spy planting (a job no one wanted); artillery direction and, when necessity arose, of fighting his way home. To fly on such a mission against such overwhelming odds was no mean feat. The combat pilots of both sides were always on the lookout for the two-place ships, as they were considered cold meat for two or more fighting planes. There is only one case on record where a reconnaissance ship was unmolested. Even archie ignored this particular plane. Combat pilots would sight it from a distance and dive in to attack, but upon recognizing it, would veer off with a smile and look for victims elsewhere. The ship was a German and was called “The Flying Pig.” It used to come out over the lines every afternoon in the same place, fly up and down and then go home. It never did any harm as far as could be observed and from the lumbering and clumsy way it was flown it derived its name. It was believed to be piloted by an old woman. When a combat ship approached too near, its attempts to escape were pathetic. It was a point of honor among Allied pilots never to harm it. One day, however, a new pilot spied it and dove to the attack. He had heard of this particular ship, and on coming close recognized it and zoomed away. No combat ship had ever come as close as this and the poor “Pig” nearly turned itself inside out getting to safety. Since it never appeared again, it was assumed that the pilot died of fright. The first ship of this type landed in the British lines near Bonnieul, on February 26th, 1918. It is first cousin to the Albatros and is like that ship in many ways. 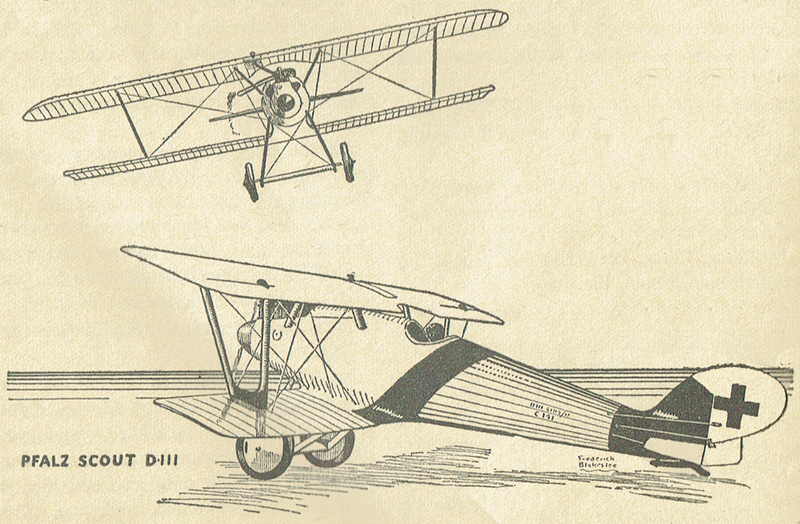 To quote from the report of the first machine captured—”It is light in construction and clean-cut in design, and from the great amount of care that has been taken to keep the fuselage of very good streamline shape, and so free from irregularities, it appears to be the result of a serious attempt to produce a scout machine with good performance. It is powered with a 160 h.p. Mercédés engine. Two Spandau guns fire through the propeller. Its speed at ten thousand feet is 102½ m.p.h. and at fifteen thousand feet, 91½ m.p.h. The estimated absolute ceiling is seventeen thousand feet. The Germans succeeded in producing a beautiful ship at all events, and one that did a great deal of damage. The faults of the DIII were corrected in a new modle, but it never appeared at the Front as the war ended before it could be brought up. Those who saw it after the Armistice said it was beter looking that the DIII, and if looks meant anything, a ship not to pick a fight wit. The original painting for this month’s cover was up for auction in 2012 by Heritage Auctions. 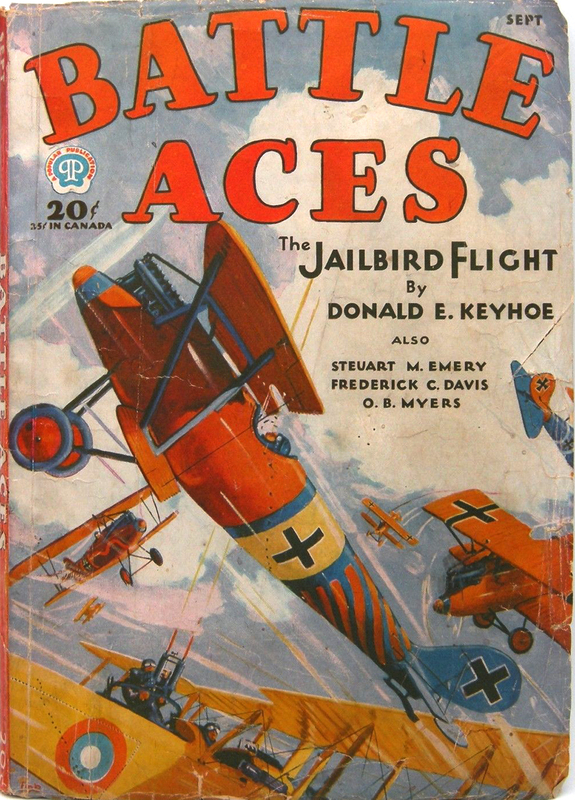 They listed it as “The Jailbird Flight, Battle Aces pulp cover, September 1931.” Oil on canvas, it measures 30¼” by 21¼” and was initialed—fmb—by Blakeslee in the lower left. It’s condition reported as: “In-painting from previous frame abrasions visble along the right extreme edge; very light surface grime in the white painted areas; stretcher creases on the upper and right edges faintly visible; area of craquelure in the upper right corner; otherwise in very good condition. Framed to an overall size of 36¾ x 28 inches.” They estimated it would sell for between $3,000 and $5,000, but in the end sold for $2,250. Once again the Devildog Squadron is roaring into action! Under guard in his hut—on a double charge of treason and murder! He had led two men out on a secret mission and they had not returned—but he had brought straight to his hidden drome a flock of Boche. And that night he was found beside the body of the man who had called him a spy—and the man was dead, shot through the heart! Yet for Larry Brent, one of those twenty loyal hellions the Boche had named Devildogs, there was always a way out—even though it led to the Squadron Without a Name.